Russell County, Alabama was prime Native American territory. The capital of the Muskogee Creek Indian confederacy. A land greatly desired by the Spanish, French, and English settlers. Its abundant rolling hills made for good ground to set up forts to watch for approaching visitors, and enemies, from miles away. The Native American had a strong presence in this area. 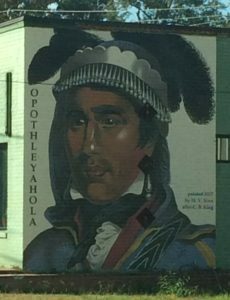 You’ll hear how they thrived as a nation of many tribes, but eventually fell into the hands of the U.S. As a result, their forced exodus to Oklahoma, the Trail of Tears. 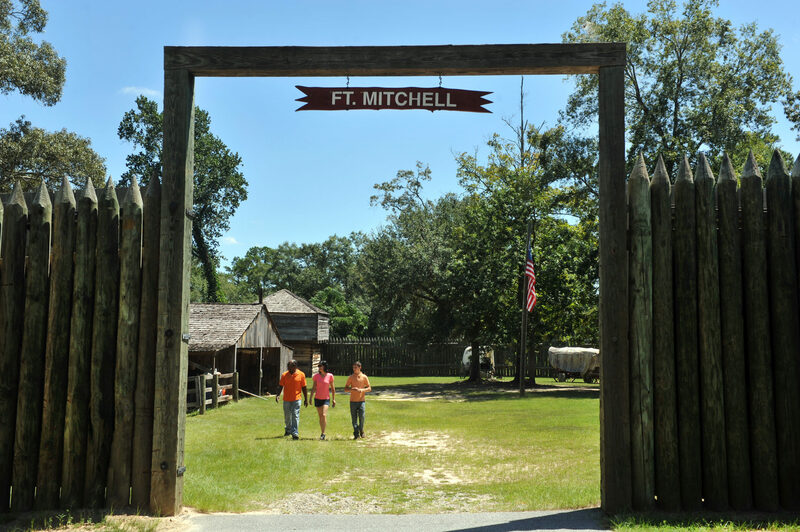 Historic Fort Mitchell will be the featured fort, a tour within the tour abounds. Ride along the paths that once was The Federal Road. Plus, a solemn visit to the Fort Mitchell National Cemetery. 24-hours notice for 2-4 people. Three-day advance booking required for groups of 5 or more. 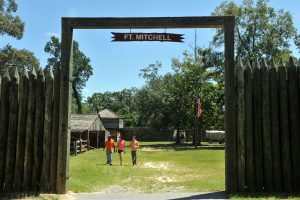 Tour price includes admission to the fort. Please allow up to 3 hours for this tour. Monday – Saturday 1:00pm-4:00pm for groups of 20 or more. Sunday – Call 762-822-6251 to schedule the tour. Meet for this tour at the Phenix City Amphitheater, 508 Dillingham Street, Phenix City, AL. It’s immediately across the Dillingham Street Bridge from downtown Columbus. First $100 are non-refundable. Refund or exchanges can be made, if your request is made more than 48 hours before the tour start time. Date of the reschedule must be within 1 year of original tour date. Exchanges can also be made, if the postponement is due to inclement weather. See “What about inclement weather?” on our FAQ page. Tour Guide on board your vehicle. Total price is based on number of guests in vehicle (NOT per person). Price does NOT include fort admission ($5-$6 per person).